J&R’s ISLIP HAS IT ALL! J&R’s Islip is serving up great steaks & burgers for almost a decade. Best known for our marinated steaks & our premium burgers, combos, daily deals, seafood and affordable prices. Here at J&R’s Islip we stand behind the Great American Family Values. We give back to our veterans’ community with our veterans buy one entree- get one free promotion on Monday & Tuesdays. Stop by and meet out friendly staff! For hardworking families, we make dining out as affordable as possible for the whole family. That’s why we offer kids eat free Sundays. J&R’s lounge has a warm and inviting atmosphere. If your looking for a quick bite and a cold beer, we have a large selection on tap & in bottles and the very best cocktails & spirits. 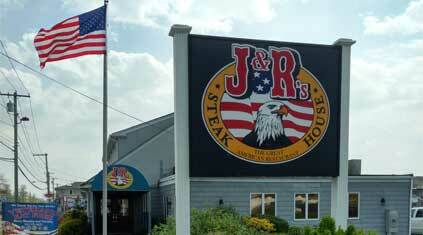 J&R’s Islip is a family owned and operated restaurant. The owner has been running steaks houses for almost 20 years and is committed to providing a dining experience you are sure to enjoy. How can you not give this place 5 stars? Best steak deal in town. Burgers are good too. Make sure you order the seasoned steak. First time customer, definitely will be back. This place is a must if you are in the area. Warm and cozy. The food is always fresh and the service is fast. Would recommend this to anyone who is just hanging out in the area.